A duck waddles into a bar and takes a seat on a barstool. The bartender asks what he can get him. The duck hops off the barstool and leaves. The next day, the duck comes back and hops back up on the stool. Again the bartender asks what he’d like. The duck blinks at the bartender. Now considering this past week has been “Your Best Grapes” contest over at Food52, I’ve had this phrase in my head for days. And for days I had a wonderful grape recipe idea percolating. But as the contest end grew closer, and my internal-screaming-that-happens-when-I’m-beyond-busy-and-should-be-doing-nothing-unnecessary-for-pure-survival kicked in, I decided to skip this one. I do still intend to make the dish soon because it imagines wonderfully—a spiced duck bacon, roasted grape compote crostini type situation—but it would not be happening this week. Or month maybe. And so I continued on with my necessary-for-survival tasks until lunch rolled around and I saw the pile of grapes on the counter. I decided to make a big grape salad and if the contest was still happening, I’d throw it up there. I did have to eat, after all, and taking a couple pictures and typing up the recipe wouldn’t take me more than about 15 minutes. And so I got to it. I sliced the grapes very thinly because I love the translucent centers and rings of purple. They were quite sweet so I wanted to add some nuttiness in the form of toasted nuts and some fresh green via basil chiffonade. I thought a hot, sizzling oil with toasted garlic and a drizzle of balsamic would add depth and punch. And finally, some crumbled cheese to balance the sweet and make it more substantial. All told it took less than ten minutes and was lovely. It would be even more satisfying with some grilled chicken on top, but made a wonderful side salad. And I made it in time for the contest with an hour to spare. This was certainly not as exciting as the duck bacon was going to be, but it was quick, tasty and pretty and I’d be happy to make it again. (Now I am just realizing that my original idea was DUCK bacon which until this very moment, telling of joke and all, I did not associate…makes sense now). Toast almonds in a dry pan until browned. Remove to a bowl. 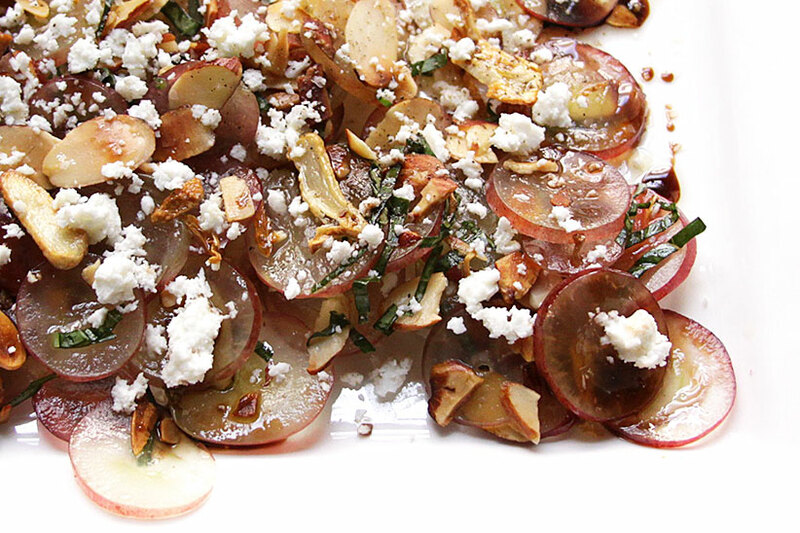 Toss gently with grapes and basil. Place on platter. Heat oil in pan and gently toast garlic until just starting to brown. Spoon garlic and hot oil over grapes. Drizzle with balsamic vinegar. Season with salt and pepper. Garnish with crumbled cheese. This entry was posted in Salad by Marina Chotzinoff. Bookmark the permalink. The salad looks really good and very different, not had anything like that before. I love the joke but I think I love this grape salad even more. Very unique and delicious!